It’s fall and the woods are quite beautiful. For the most part, the bugs have started packing it in, even though we haven’t had a frost yet. I can spend hours in the woods, enjoying a soft breeze, with nary a bite to show for it. There are times where I just sit on one of my stumps up there and wait for something to happen (it usually does). I never run out of interesting things to see in the woods, despite the fact that they really aren’t all that large. Of course, it’s also the time of the year when I’m cutting wood for winter. So, I often go up with my chainsaw in hand, looking for wood to cut up. 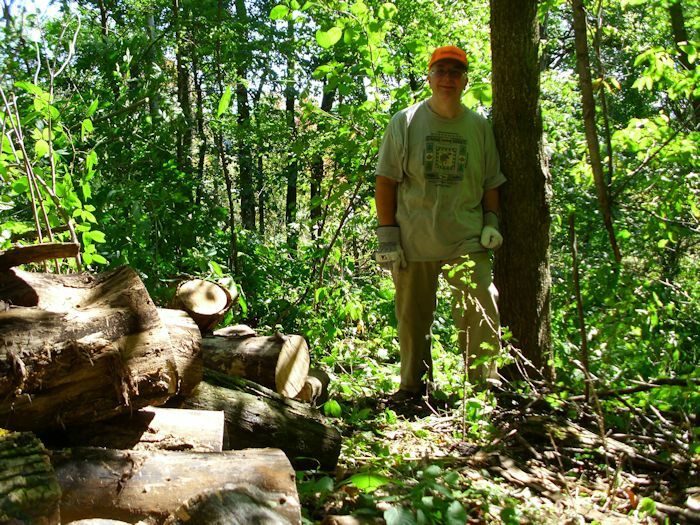 The first priority is to keep the woods clean, so I start by cutting anything that is already lying around. Even small wood burns, so I’m not too particular about what size the logs are. Sometimes I find a log that is quite dry and burns nicely lying right there on the ground. In fact, that’s where I found these piece that I cut up. There is an equal mix of slippery elm and black locust in this case. Both woods burn quite nicely. These pieces are quite dry, but not rotted. Even if there were some rot, I’d take the wood because it’s better to keep the woods cleaned up whenever possible and wood with a little rot still burns just fine. After I get done looking for fallen wood, I find any snags (trunks that lack limbs) that no one is using. It’s important not to cut down every snag because owls and other birds often nest in them. In addition, it could be a matter of self-preservation because bees will also nest in the snags at times. (For this reason, I actually put my ear up to the trunk and listen for a while.) On this particular day, I found a wonderful piece of black locust to cut up. This snag looks like a mess. It doesn’t appear to be usable. The inside has rotted out and there are shards where the tree was hit by lightning. However, this is black locust and the wood is actually quite good. Cutting into it, I found that the outside had indeed rotted a little (up to a half inch), but the inside was both sound and dry. so, the snag ended up on the wood pile along with everything else. On this particular day, I found everything I needed on the ground or as a snag. However, there are some days when I do need to cut a tree down. When this happens, I look for trees that are already completely dry (the bark has come off of its own accord) and no one is using. Even with these restrictions, I usually find all I need. All it takes is a little looking and given the beauty of these woods, looking is something I like to do. 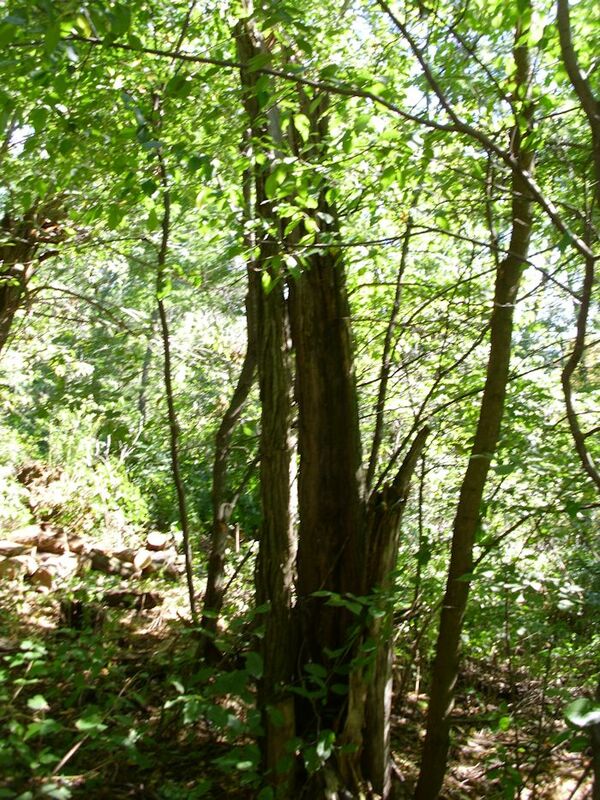 Notice that these pictures show that the woods is intact. It’s what I try to achieve when I cut wood for winter. I leave all of the young trees and anything that’s alive intact as much as possible. Even the ground vegetation is left intact except for the narrow path I create for myself. (All the wood is carried down by hand to minimize damage.) Using management techniques like these ensures that the woods will continue to look beautiful and produce wood well into the future. Have you taken a stroll through a woods lately? Let me know your thoughts about careful management techniques at John@JohnMuellerBooks.com.